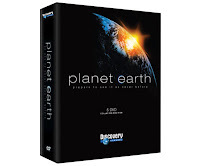 So, this girl at work let me borrow her Planet Earth DVDs. This stuff is absolutely crazy. I think that some of these Christian stations should give up one hour of broadcasting a day, and replace it with one of these episodes. I can't imagine a more compelling visual evidence for a Creator God than seeing these crazy, absolutely made-up looking animals in the vast corners of the Earth. The show's narrator does a pretty good job explaining how godless evolution could create the utilitarian features that we see these animals display. But, he can't explain the aesthetic amazement. isnt the narrator sigorney weaver? the narrator is a man...so maybe?